原文:Before we understand science, it is natural to believe that God created the universe. But now science offers a more convincing explanation. What I meant by ‘we would know the mind of God’ is, we would know everything that God would know, if there were a God, which there isn’t. I’m an atheist. 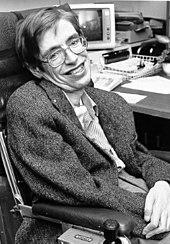 Hawking stated that he was "not religious in the normal sense" and he believed that "the universe is governed by the laws of science". Hawking stated:There is a fundamental difference between religion, which is based on authority, [and] science, which is based on observation and reason. Science will win because it works. 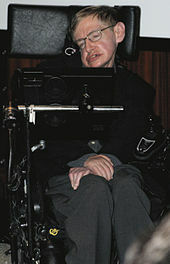 In 2008, Hawking stated, "The laws may have been decreed by God, but God does not intervene to break the laws". "the brain as a computer which will stop working when its components fail”, and the concept of heaven as a myth, believing that there is "no heaven or afterlife" and that such a notion was a "fairy story for people afraid of the dark". "Einstein was wrong when he said "God does not play dice". Consideration of black holes suggests, not only that God does play dice, but that He sometimes confuses us by throwing them where they can't be seen." "Someone told me that each equation I included in the book would halve the sales. In the end, however, I did put in one equation, Einstein's famous equation, E = mc2. I hope that this will not scare off half of my potential readers." "My expectations were reduced to zero when I was 21. Everything since then has been a bonus." "To show this diagram properly, I would really need a four dimensional screen. However, because of government cuts, we could manage to provide only a two dimensional screen." "I find that American & Scandinavian accents work better with women." In response to a question about the American accent of his synthesiser. ↑ 大小霍金悼念本尊 艾迪瑞德曼：痛失天才. 自由娛樂. 2018-03-14 [2018-03-15]. ↑ 黃岸. 霍金、纪梵希离世 重温影视经典缅怀大师. 中国网. 2018-03-15 [2018-03-15]. ↑ 無畏束縛把握時光 霍金一生探索宇宙奧祕. 中央社. 2018-03-14 [2018-03-15]. ↑ David Edwards (24 September 2014). "Stephen Hawking comes out: 'I'm an atheist' because science is 'more convincing' than God". Raw Story. Retrieved 25 September 2014. ↑ Boyle, Alan (23 September 2014). "'I'm an Atheist': Stephen Hawking on God and Space Travel". NBC News. Retrieved 12 January 2017. ↑ Stewart, Phil (31 October 2008). "Pope sees physicist Hawking at evolution gathering". Reuters. Retrieved 22 May 2009. ↑ Overbye, Dennis (14 March 2018). "Stephen Hawking Dies at 76; His Mind Roamed the Cosmos". The New York Times. Retrieved 14 March 2018. ↑ Sample, Ian (15 May 2011). "Stephen Hawking: 'There is no heaven; it's a fairy story'". The Guardian. Retrieved 17 May 2011. ↑ "Stephen Hawking – There is no God. There is no Fate". Retrieved 4 July 2013. ↑ Lowry, Brian (4 August 2011). "Curiosity: Did God Create the Universe?". Variety. Retrieved 14 March 2018. ↑ 徐丹 (编). 霍金：科學進步能帶來巨大經濟利益. 人民網. 2006-06-21. ↑ 吳嘉俊. 霍金：有生命就有希望. 大紀元. 2006-06-14. ↑ Hawking, Stephen. Why We Should Go Into Space (PDF). 2008-04-21.